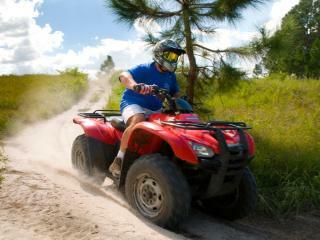 No waiting in line and watching a video, we put you in the seat of your own single seater ATV for a thrilling guided tour around 230 acres of traditional Florida landscape. Your guided ride will take you through sand, mud, swamp and forest! Whether novice or expert this is a perfect place to try an off-road driving in a safe environment. Your experience starts with a safety briefing and you will also be given helmet goggles and gloves. Then, you will be taken on a guided adventure by the instructors over the humps and banks. Be prepared to get dirty... VERY dirty! These trails are designed to appeal to both first time riders and those looking for a more extreme experience. The fat wheels and low centre of gravity means that even a novice can get very adventurous, racing up and down the specially created track. You will be in the driving seat for around 80 minutes with a short break for drinks and the entire experience lasts around 2 hours. At the end of the session you will have time to take photos, relax over a soft drink, enjoy the views of the picturesque lake and discuss your experience before you leave. Start Times: The Orlando ATV Experience runs daily and there are 4 start times to choose from: 8.30am, 10.30am, 12.30pm 2.30pm or 4.30pm. Duration: Around 2 hours in total with around 80-minutes driving time. What to Bring: Comfortable clothing is recommended and closed toe shoes and long trousers are a must. Remember you will get dirty! Drivers must be aged 18+ years.